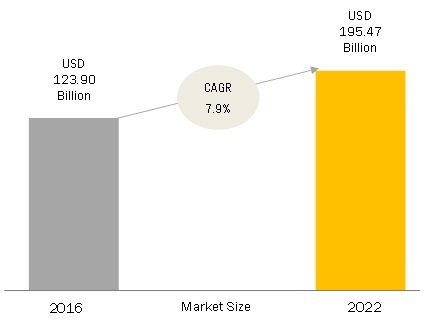 [178 Pages Report] The overall system integrator market for industrial automation is expected to grow from USD 41.47 billion in 2016 to USD 56.05 billion by 2022, at a CAGR of 5.0% from 2017 to 2022. System integrators are the companies that help manufacturing plants to deploy and install hardware and software solution. In related to industrial automation, system integrators are the entities that provide clients the service for consultation, hardware installation, software integration, and system maintenance. The system integrator market is expanding with the growing implementation of automation technologies in industries, which offers manufacturing companies benefits in terms of high productivity, good quality of products, reduction in energy and cost, and low wastage. The base year considered for the study is 2016, and the forecast has been provided for the period between 2017 and 2022. Internet of Things (IoT) is having a significant impact on industrial automation and control across the world. With the penetration of IoT, the performance of systems will increase and offer cost-savings in the long run. IoT integrated technologies, such as processors, sensors, analytics software, actuators, control valves, vision system, and widely distributed architectures, offer low-cost industrial automation system designing opportunities. IoT forms the connection between electronic devices in manufacturing systems using communication protocols such as Wi-Fi, Bluetooth, ZigBee, etc. Industrial Internet of Things (IIoT) has largely been adopted in every industry, with technology giants, such as GE (US), IBM (US), and Cisco (US), having integrated IIoT as a core component of their businesses. Industrial automation plays a major role in process industries such as oil & gas, chemical and petrochemicals, pulp & paper, water treatment, mining, and energy. The industrial automation market will likely be driven by IIoT and is expected to grow at a CAGR of 7.9% over 2016–2022. During this research study, major players operating in the system integrator market in various regions have been identified, and their offerings, regional presence, and distribution channels have been analyzed through in-depth discussions. Top-down and bottom-up approaches have been used to determine the overall market size. Sizes of the other individual markets have been estimated using the percentage splits obtained through secondary sources such as Hoovers, Bloomberg BusinessWeek, and Factiva, along with primary respondents. The entire procedure includes the study of the annual and financial reports of the top market players and extensive interviews with industry experts such as CEOs, VPs, directors, and marketing executives for key insights (both qualitative and quantitative) pertaining to the market. The figure below shows the breakdown of the primaries on the basis of the company type, designation, and region considered during the research study. The system integrator market comprises a network of players involved in the research and product development; raw material supply; component manufacturing; distribution and sale; and post-sales services. 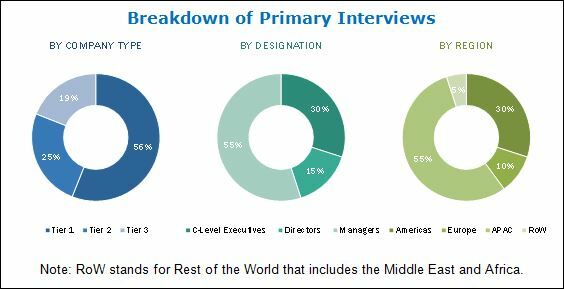 Key players considered in the analysis of the system integrator market are Wood Group Mustang (U.S.), Prime Controls LP (U.S.), ATS automation (Canada), Maverick Technologies (U.S.), Wunderlich-Malec Engineering (U.S.), Mangan Inc. (U.S.), Avanceon (U.S.), Dynamysk Automation Ltd. (Canada), Tesco Controls Inc. (U.S.), and Stadler + Schaaf Mess – Und Regeltechnik GmbH (Germany). In January 2017, Wood Group secured a 5-year agreement with Saudi Aramco to provide engineering and project management services. This new agreement was given to the company after the successful completion of the previous project for modifications, automation and controls, and pipeline and industrial engineering. In October 2016, the leading system integrator—Maverick Technologies—was acquired by Rockwell Automation. This helped the company to expand its domain knowledge, deliver innovative control, and information solutions for customers in oil and gas, food and beverages, and chemical industries. In July 2015, Wunderlich-Malec Engineering launched a VIP services maintenance app—designed to improve efficiency, reduce downtime, increase productivity, and attain key performance indicators—for the industrial automation market. What are new application areas which the system integrator companies are exploring? The overall system integrator market for industrial automation is expected to grow from USD 44.00 billion in 2017 to USD 56.05 billion by 2022 at a CAGR of 5.0%. . The major factors driving the growth of the system integrator market for industrial automation include the growing usage of Internet of Thing (IoT) in industries, rising safety and security concerns, demand for low-cost energy-efficient production processes by manufacturing plants, and need for automating complex processes. The system integrator market has been segmented, on the basis of services, into consulting, hardware integration service, and software integration service. The software integration services are expected to hold the largest share of the system integrator market during the forecast period owing to the wide acceptance of software applications and their integration services for industrial automation. The PLC, PAC, and RTU technology held the largest share of the system integrator market in 2016. The growth of this market can be attributed to the huge demand for controlling the manufacturing plant machinery. This technology collects data from various sources in plants and sends it to the SCADA or DCS for analysis at remote locations. The market for the automotive industry is expected to grow at the highest rate between 2017 and 2022 owing to the increasing inventory management, performance analysis, design process, and supply chain management in these industries. The growth in the automotive industry owing to the increasing global demand for vehicles is encouraging companies to increase their production rates, thereby leading to the increasing adoption of automation in the industry. The Americas held the largest share of the overall system integrator market for industrial automation in 2017 owing to the widespread penetration of process industries in this region. This has increased the need for the implementation of automation solutions in these industries. In various industries, system integrators play a vital role by providing services related to automation, which, in turn, help increase productivity and improve occupational safety. The oil & gas industry requires a great deal of automation in the plant for the efficient management of the production and supply. There is a high demand for automation in the industry because there is a need for integration in the information flow and control to provide safety and achieve production levels. Maintaining the automation in safety systems is necessary in the oil & gas industry according to the stringent government norms. The companies are searching for new avenues in automation technology to build smart plants. The pumping and compression stations can be remotely monitored and controlled using remote terminal units (RTUs) to enhance the safety of the employees in the industry. Major companies offering automation solutions to the oil & gas companies are ABB (Switzerland), Emerson Electric Company. (U.S.), Honeywell (U.S.), Rockwell Automation, Inc. (U.S.), and Siemens AG (Germany). Major system integrators involved in the process with these OEM providers are Prime Controls LP (U.S.), Maverick Technologies (U.S.), Wood Group Mustang (U.S.), INTECH Process Automation (U.S.), and Mangan Inc. (U.S.). A large number of chemical and petrochemical companies are adopting automation technologies to increase productivity, ensure efficient material usage, improve product quality, enhance safety, and reduce factory lead times. Automation also helps in working with hazardous chemicals and materials. The core objective of the manufacturers in this industry is to provide a large variety and high quality of food, along with high production in low cost. The industry faces challenges due to the constantly changing demand from the customers and rising cost of materials. Apart from this, companies have to satisfy the regulatory compliances and manage the supply chain in the market. The companies adopt automation for homogenization and pasteurization processes, where precise temperature measurement and control & monitoring are necessary to increase the shelf life of products. In automotive industries, automation plays a vital role in inventory management, performance analysis, design process, and supply chain management. In an assembling process, automation helps companies to reduce the time and increase productivity. Welding, cleaning, and joining are the time-consuming processes in this industry. Processes such as pneumatic, fluid, and motion control components need high accuracy during assembling to prevent defects in the product during batch processing. Therefore, manufacturers install automation solutions in the plant to enhance their productivity. Which growth strategy system integrators should implement to increase their revenue? What are the key system integrators for industrial automation? The high investment required for automation implementation and maintenance is a major restraining factor for the growth of the system integrator market. The installation cost includes supervisory solution cost, device cost, communication networking cost, and maintenance cost. 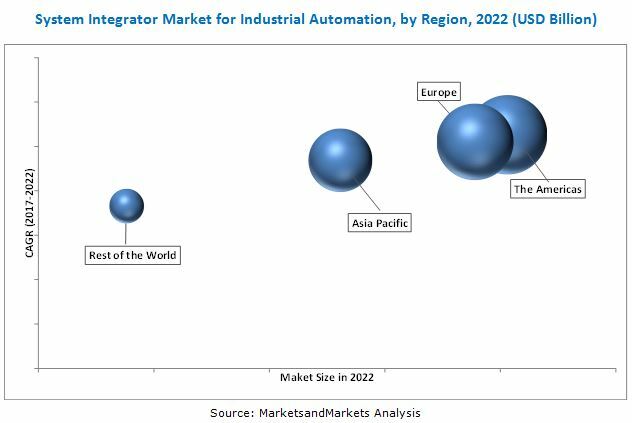 Dominant players in the system integrator market for industrial automation include Wood Group Mustang (US), Prime Controls LP. (US), ATS Automation (Canada), Maverick Technologies (US), Wunderlich – Malec Engineering (US), Mangan Inc. (US), Avanceon (US), Dynamysk Automation Ltd. (Canada), Tesco Controls Inc. (US), Stadler+Schaaf Mess–Und Regeltechnik GmbH (Germany), INTECH Process Automation (US), Design Group (US), CEC Controls Co. Inc. (US), Burrow Global LLC (US), and Matrix Technologies (US). These players adopted various strategies such as new product developments, acquisitions, partnerships, expansions, agreements, and contracts to achieve growth in the market. *Top 25 Companies Analyzed for This Study are – Wood Group Mustang, Maverick Technologies, Wunderlich-Malec Engineering, Mangan Inc., Intech Process Automation, En Engineering, ATS Automation, Design Group, Dynamysk Automation Ltd., Avanceon, Matrix Technologies, Autopro Automation Consultants, Premier System Integrators Inc., Applied Control Engineering Inc., Avid Solutions, Prime Controls LP, CEC Controls Inc., Tesco Controls Inc., Stadler + Schaaf MESs-Und Regeltechnik GmbH, Burrow Global LLC, Champion Technology Services Inc., Optimation Technology Inc., Testengeer Inc., Stone Technologies Inc., Hallam-Ics. 11.14 CEC Controls Co. Inc.